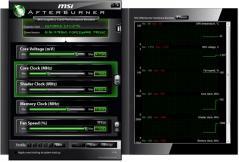 MSI Afterburner is a superior graphics card tool created by the collaboration of MSI and RivaTuner. The tool provides all users the ability to boost the performance of all MSI graphics card as well as keep an eye on important information at a glance. The app is a comprehensive solution that supports practically all graphics cards. - Is based on RivaTuner core – the afterburner combines the RivaTuner’s technologies in a user friendly interface with unified features for NVICIA and AMD graphic cards. No need to change your software when you wish to migrate from AMD to NVIDIA or the other way around. The afterburner offers the same functions for hardware that is seen with GPU vendors with easy migration process. You only need to keep an eye on overclocking and GPU like before without the need to change your preferences and search for other tools after upgrading the graphics card. - User extendable architecture – allows you to create and design skins for MSI Afterburner, create language packs, and create additional apps interacting with MSI Afterburner. You can even share your creations with other users. - Advanced fan control: gives you the ability to use the manual fan speed mode or the automatic fan speed mode, which is the default. In addition Afterburner also offers user defined automatic fan speed mode giving you the power to define your own fan speed curve. In order to use the program users will need Microsoft Visual C++ 2008 runtime libraries, NVIDIA GeForce 6, and AMD RADEON HD 2000 drivers. Build Lego layouts out of your favorite images in a couple of seconds. A lightweight piece of software that allows provides you with an intuitive environment to create, edit, compose and convert bitmap images.